Q: I need to build a retaining wall in my yard, but I’m worried about having proper drainage. What can I use to avoid drainage issues? A: Living in a state as soggy as ours gives people pause when launching new yard projects. But there is a great drainage solution that will keep your yard from becoming a swamp: gabion baskets. Gabion baskets have been used in functional structures for 7,000 years. In the last century they became hugely popular with civil engineers, and have more recently become a hot item in homeowners’ yards. Decorative appeal may have made gabion baskets popular, but their durability and flexibility have made them indispensable. Because gabion baskets are easy. They require minimal skill, no equipment and very little time to assemble. They are perfect for those of us who want a big payoff with minimal effort — with our busy lives, who doesn’t want that? To construct a gabion basket, you must assemble the basket itself, place it where you want it, and then fill it. It’s that simple! If you’re looking for drainage, you will want to fill the basket with larger rocks so water can flow through it without sweeping everything away. Because these baskets are so adaptable, they are easy to install in most yards. What do you fill them with? There are two essential things to consider when deciding what to put in the baskets: the size of the rock and the aesthetic you’re creating. With respect to size, the rocks must obviously be larger than the holes in the basket. You’ll likely want a rock between the size of an orange and a grapefruit. Now consider how it’s going to look. If you’re going for a more industrial style, for example, you’ll want grey rocks. We suggest filling the basket with granite for a more decorative look or round river rocks for a more natural Northwest quality. If you want something less staid, you can pick out multiple colors. Be creative! How will gabion baskets interact with my plants? One of the things I love most about gabion baskets is that after a few years your plants will begin to grow through and over them. The vegetation surrounding the basket adapts to it, growing around as needed. Because of this, the basket’s environmental impact is minimal, versus the concrete blocks people often use for retaining walls. Of course, you can fill the basket with a recycled product like concrete too — it’s adaptable. 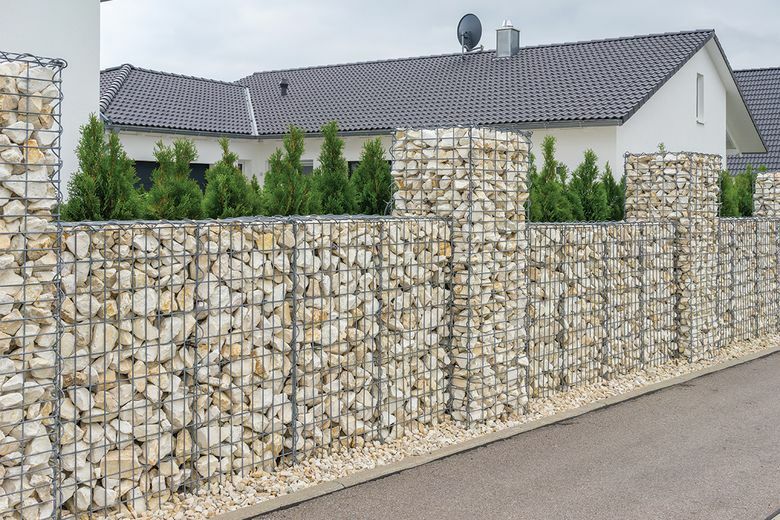 Either way, using gabion baskets as retaining walls means using more natural and recycled products in your yard. Merri Christianson works at Clearview Nursey & Stone, a member of the Master Builders Association of King and Snohomish Counties (MBAKS). If you have a home improvement, remodeling, or residential homebuilding question you’d like answered by one of MBAKS more than 2,800 members, write to homework@mbaks.com.